Discount airfares to Osaka, Japan offered by Brightsun Travel | Book now! Osaka, one of Japan’s largest cities is an incredible metropolitan destination with a host of colourful neon signs, mega malls, ancient shrines, architectural wonders, museums, local markets and traditional Bunraku puppet shows. This charming city is home to plenty of amazing landmarks and attractions; you can start by visiting the oldest official temple in Japan - Shitenno-ji which was founded by Prince Shotoku in 593. Then there’s Sumiyoshi Taisha, a historic shrine believed to date back to 211 AD, featuring ancient sumiyoshi-zukuri style architecture. 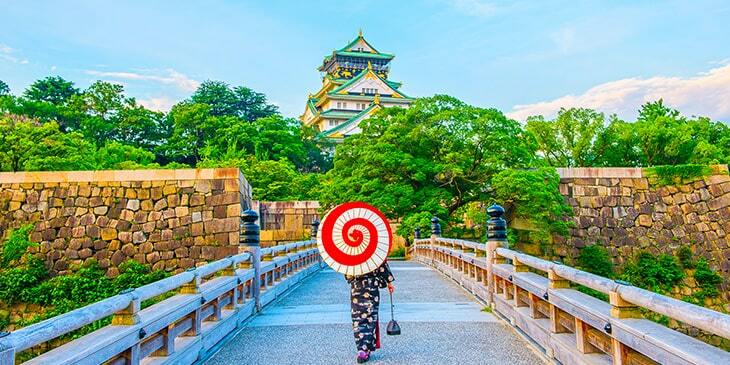 Don’t miss Osaka Castle – one of the country’s most renowned landmarks and a visually stunning masterpiece, comprising of a network of turrets, walls and citadels surrounding a large central tower. Once you’ve visited Osaka’s top sightseeing spots, you could spend the day at Osaka Aquarium Kaiyukan, one of the world’s largest aquariums home to 30,000 creatures which includes otters, penguins, whale sharks, rays and dolphins. Brightsun Travel offers an excellent range of cheap flights to Osaka all year round, taking you to this unique Japanese city in style. Osaka is considered as the food capital of Japan with a large number of Michelin starred restaurants, authentic local cafes and street food vendors serving up lip-smacking Japanese dishes. Popular Osaka specialities include okonomiyaki pancakes, ramen noodles and Kushikatsu skewers. Osaka also boasts a number of captivating museum spaces which introduce you to the city’s art, history, cultures and more. The Open Air Museum of Old Japanese Farmhouses is well worth a visit; this remodelled folk village features a selection of restored traditional structures and farmhouses taken from various areas of Japan. Mint Museum is another interesting venue which showcases a collection of old Japanese coins, plus a beautiful cherry tree garden that is best viewed during the spring season. Then there’s the Koji Kinutani Tenku Art Museum, which displays colourful 3D visuals, paintings and sculptures. Book cheap tickets to Osaka and look forward to discovering the many gems of this amazing city. Osaka is a great base for exploration; you could go on to explore Kyoto, one of Japan’s most traditional cities which can be reached via train in around an hour, or a bullet train in about 15 minutes.